Arguably the most critical (and often overlooked) part of investing is due diligence. Investors may not know what to look for or where to find it necessarily. However, one large piece of one’s due diligence can be relatively easy to find and it lets you know that you are not alone in committing your hard-earned dollars: take a look at insider holdings. Investors absolutely need to take in to account management putting their money where their mouth is. If management, board members and insiders own a significant piece of the Company, their financial interests align with yours. You will all make or break together. Here are two companies we think have stellar management teams. These management teams are also believers in themselves as they are significant shareholders. 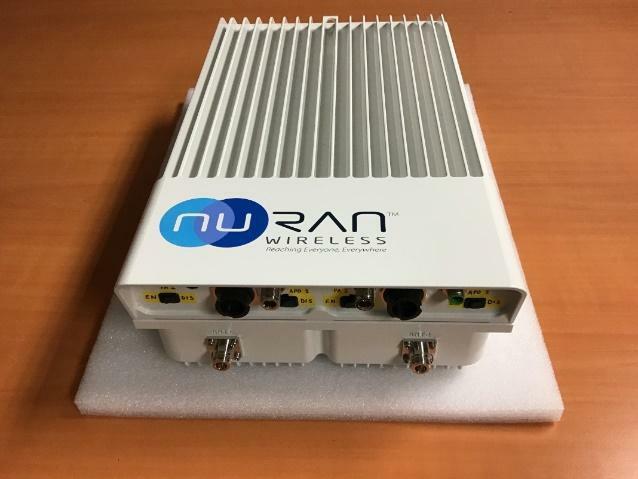 A wireless technology company growing at an extremely rapid rate recently is NuRAN Wireless Inc. As stated in our recent report on NuRAN Wireless, management and insiders hold approximately 60% of the current tradable float. If their current holding isn’t convincing enough for skin in the game, NuRAN announced that the company will be raising CAD $1.5 Million dollars at a price of $0.10 cents with half of a warrant at $0.15 cents and that management and directors will participate in the private placement. NuRAN Wireless will soon be attending this years coveted Mobile World Congress (MWC) in Barcelona, Spain from February 25th – February 28th 2019. MWC Barcelona (formerly Mobile World Congress) is the largest mobile event in the world, bringing together the latest innovations and leading-edge technology from more than 2,400 leading companies, with a highly-rated conference programme assembling today’s visionaries to explore the hottest topics influencing the industry. Mobile World Congress will be hosting technology companies from all around the world including keynote speakers such as Satya Nadella CEO of Microsoft and Chuck Robbins, CEO of Cisco. The lineup of keynote speakers indicate event is a major one in the mobile industry and of significant importance to an emerging company like NuRAN Wireless that is growing at unprecedented rates. MWC Barcelona is a major event for any company involved in the mobile, telecommunications and technology as companies, it’s like to worldwide congress of the industry. Players from all around the world will be attending and NuRAN will hopefully be able to book purchase orders or even establish possible partnerships. Expectations for NuRAN are pretty high especially since they will be unveiling their new product LiteCell xG at this years MWC. For those who don’t know yet, the LiteCell xG provides mobile network operators (MNO’s) the flexibility to implement a 2G, 3G or 4G network which can be upgraded all the way up to 5G. The LiteCell xG is exactly what MNO’s are looking for: a cost-effective turn-key solution for their current and future needs. In 2018 NuRAN revamped their business with a complimentary business model. The Mobile Network Enabler (MNE) was deployed in Q4 2018 and immediately translated in to a partnership with Spacecom’s AMOS-17 Satellite for a trilateral sales agreement valued CAD $9,000,000 in the first 12 months and CAD $90,000,000 over the lifetime of the scale up. This proves just how nimble NuRAN is and how fast it is growing. Add to the above, the recent purchase order of $1,250,000 from Africa Mobile Network and the balance sheet starts to look amazing for a company trading at a $9,000,000 market cap. We wouldn’t be surprised if the company secured more purchase orders from attending Mobile World Conference in Barcelona. Lots of people, lots of companies, lots of possibilities! Kontrol is another company with a large insider ownership. Insiders own more than 45% of the shares out! Kontrol was recently nominated as Canada’s 7th fastest growing start-ups and is a leader in the energy efficiency sector through IOT, Cloud and SaaS technology. More recently, Kontrol has begun securing contracts with large licenced producers in the cannabis industry. These large cultivators devour energy and need all the help they can get to reduce their energy consumption and lower their OPEX. We believe that price pressures and competition in the cannabis industry is about to heat up. Large producers will need to lower their prices in order to gain market share as the industry grows and the number of industry players increases. The best way to lower their input costs is to cut down on one of their largest expenses: energy. If one looks at the press releases already issued by Kontrol, one will see that the Company already has three agreements executed with licensed producers in Canada. For industry competitive purposes, Kontrol Energy has had to withhold the names of their cannabis clients, but they have said that they are all located in Ontario. It seems as though services and products offered by Kontrol are now becoming an “industry secrets”. But rest assured, the sales team at Kontrol is aggressively marketing in the industry. The image below shows an interesting extrapolation, this is no way to be construed as material or factual but is nonetheless an interesting finding. 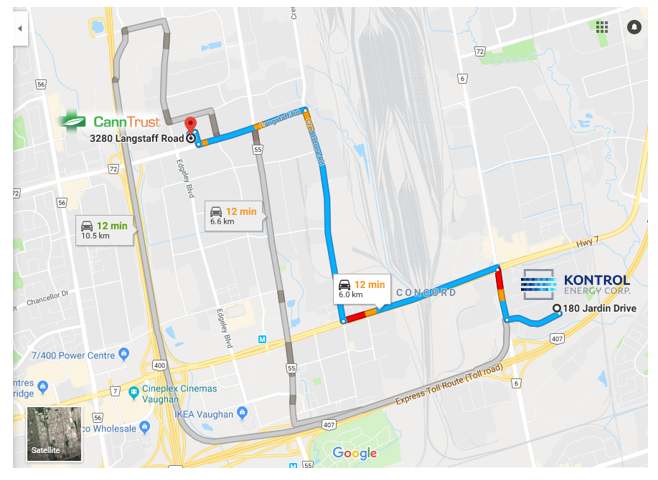 If we google the corporate address for Kontrol Energy we get 180 Jardin Drive, and according to the CannaTrust MD&A, they are located at 3280 Langstaff Road, a mere 12-minute drive apart. The proximity between both Kontrol Energy and CannTrust is quite interesting and well, why not do business with a neighbour! Although primarily an energy company, Kontrol is building vertical revenue streams by integrating technology solutions it can offer current and future clients. With a run rate of $16 Million dollars through its various acquisitions and its anticipated growth, Kontrol is building cash flow generating machine that will benefit all shareholders, chief of which are the insiders. 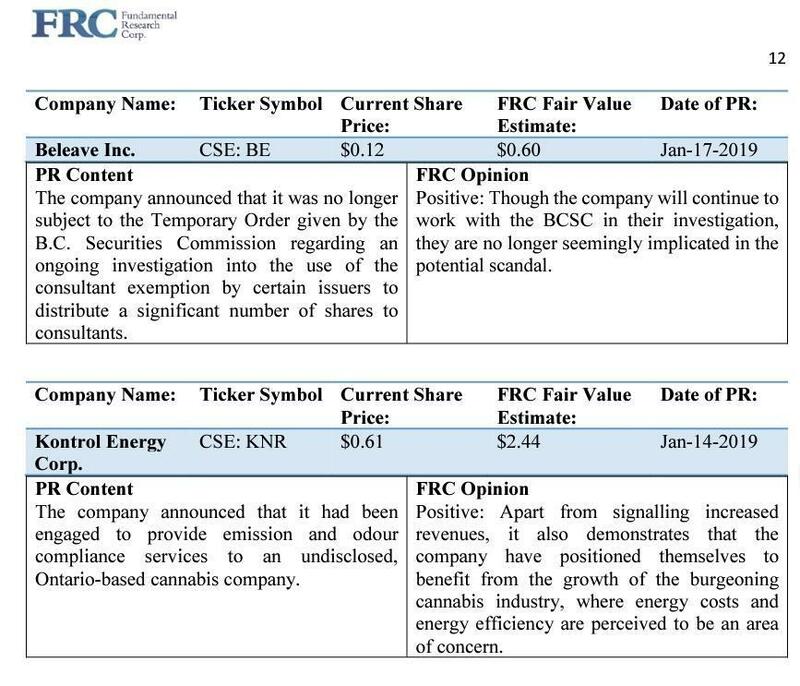 According to Fundamental Research Corp., they interestingly put Canadian licensed producer Beleave Inc. at $.60 cents per share and more notably placed a Fair Market Value on Kontrol Energy Corp. at $2.44 per share which at the time of writing was at $0.61 cents per share. This gives KNR an increase of 300% from its current level and would represent a market capitalization of $70.76 Million. A $70 Million-dollar market cap on $16 Million revenue would give a 4.4 Price – Sales Ratio (PSR), which we consider to be a great valuation and one that management and shareholders could reasonably be looking for.